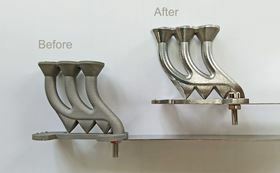 AM parts before and after the coating process. Vacuum/plasma process specialist the Wallwork Group is developing a new technology to remove the rough and irregular finish that can occur on additive manufactured (AM) metal components. The project is an international collaboration with the University of Manchester materials science department along with an AM processor in France and dental implant manufacturer in Italy. According to the company, AM components can have a rough and unattractive surface finish. As the AM process often produces highly complex parts that would be difficult to make by any other method, these parts are both problematic and expensive to smooth using mechanical techniques and also may require some hand finishing. This time-consuming and costly final processing slows the production cycle and can undermine the economic viability of additive manufacturing. Wallwork Cambridge operate one of Europe’s largest facilities for the application of advanced micro-thin coatings for aerospace, motorsport and medical applications using physical vapor deposition (PVD) and plasma enhanced chemical vapor deposition (PECVD). The program of process development, machine build and live trials to prove the effectiveness of the system in manufacturing environments will last 29 months after which the partners believe they will have enough data to begin to commercialization the technique. This story is reprinted from material from the Wallwork Group, with editorial changes made by Materials Today. The views expressed in this article do not necessarily represent those of Elsevier.